The Blooming Bath™ is a soft, supple insert that fits perfectly into any sink for a safe and comfortable bath-time experience. 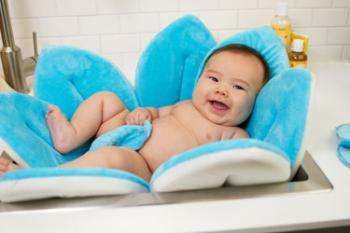 It’s petals fold and bend to fit any sink, and unlike traditional baby bath tubs, is made from plush materials providing an unbelievable adorable and comfortable bath. When bath time is over, just rinse, wring and throw into the dryer or hang dry. When baby grows up and graduates to a tub, the Blooming Bath™ does too. No more slipping around in the big, slick tub because the Blooming Bath™ makes a great play mat right outside of the bathtub. Measures 32″ in diameter. Recommended for babies 0 to 6 months old.